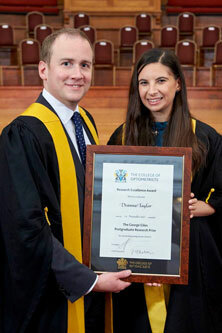 Deanna Taylor, a PhD researcher working in the Crabb Lab at City, University of London has won the prestigious George Giles Postgraduate Research Prize from the College of Optometrists for her research into visual disability in dry age-related macular degeneration (AMD). The award was one of seven given by the College as they recognised the achievements of some of the leading researchers in the field of optometry at its annual Diploma Ceremony in Central Hall Westminster in London. Deanna – who is approaching the end of her PhD, supervised by Professor David Crabb and Dr Alison Binns – was awarded the prize for her research which demonstrated that there is a disproportionately-low focus on dry AMD amongst published studies. It has also looked at the impact of AMD on real-world activities of daily living, and should help to ensure that much-needed treatments in the process of development are evaluated against the most useful outcomes for patients, rather than only arbitrary or theoretical measures of improvement. Read more about the Research Excellence Awards.